The new gas engine MAN E3268 LE2x2 is based on a newly developed base engine in line with the latest technological standards. Its power output has been raised by 40 per cent from that of the predecessor. At the Agritechnica trade fair in Hanover (10 to 16.11.2013, Hall 23, Stand C04) MAN will be presenting its new eight-cylinder E3268 LE2x2 engine for the first time. Its power output has been raised by 40 per cent from that of the predecessor model to 370 kWmech. Optimisation of the engine specifically for natural gas or biogas gives the operators flexibility, as they can use it to suit the fuel envisaged for the project in hand. The newly developed base engine is in line with the latest technological standards and provides maximum efficiency in operation and in maintenance and service. The E3268 engine generates up to 370 kWmech at 1,500 min-1. Depending on the gas used, its efficiency amounts to up to 42 %mech. As the pressure losses in the coolant circuit of the gas engine have been reduced, a smaller external engine coolant pump can be used. This in turn improves the overall efficiency of the system. Efficiency under part load too has been significantly increased. With its cylinder bore of 132 mm and a stroke of 157 mm the E3268 LE2x2 now develops its power from a cubic capacity of 17.2 litres. 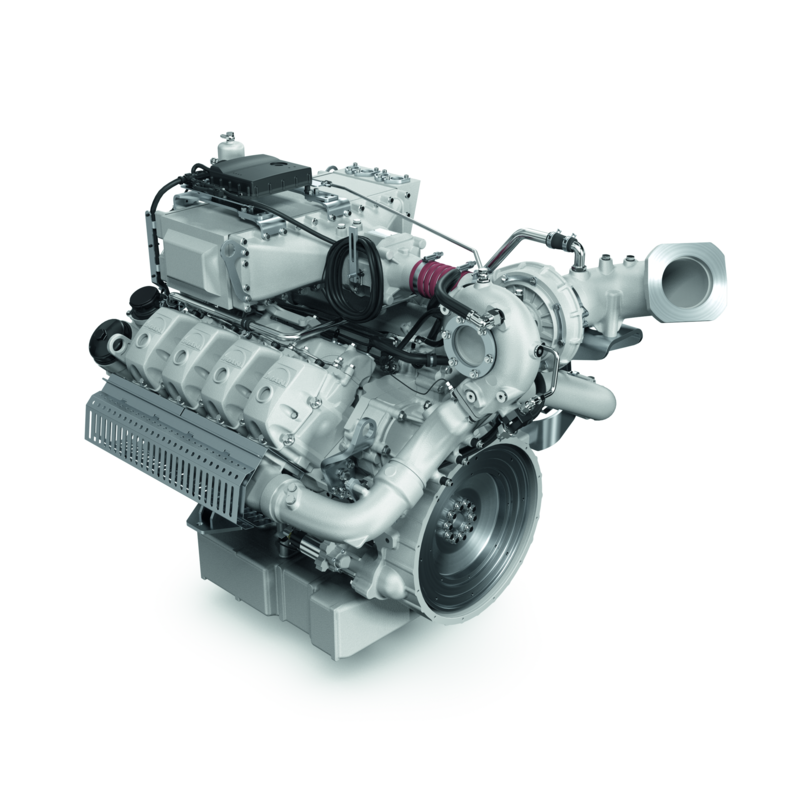 Its output of 21.5 kW per litre capacity too is considerably higher than that of the predecessor model, the E2848. Both the natural-gas and the biogas variants of the E3268 comply with the current (German) emission guidelines, TA-Luft. The engine is extremely flexible: it comes as the E3268 LE212 for use with natural gas with a compression ratio of ε 12:1 or as the E3268 LE222 for biogas operation with a compression ratio of ε 14:1. "Both units are ideally configured for their intended purpose with appropriate design of the combustion chamber and specially adapted pistons", said Hubert Gossner, Head of Power MAN Engines. Beside increasing the power output of the new eight-cylinder unit the engineers are consciously counting on the familiar reliability of MAN engines. "The E3268's base engine has already proved itself for several years in agricultural machinery, in marine engines and in heavy trucks. On this basis MAN has perfected a reliable engine developed using the latest technology and subjected it to comprehensive trials in the field", said Mr. Gossner. The new technology includes a four-valve cylinder head optimised for the charge cycle and the reduction of friction inside the engine through use of roller tappets or special sliding bearings, for example. A new feature for customers is electronic data recording using sensors for important parameters such as coolant temperature, boost pressure and oil pressure. With a CAN interface these data can be made available in an uncomplicated manner for controlling the system. This year too, from 10 to 16.11.2013, MAN will be putting in an appearance at the Agritechnica as a provider of efficient combustion engines. In Hall 23, Stand C04, the public can for the first time view exhibits and find out the technical details of the new engines for energy generation or off-road applications.